I was always really annoyed in English, or even Art classes, when a the teacher said: "Now why did the artist choose that?". Urm, well I don't know. It looked pretty; it flowed well; it sounded right. To this day, I still think that most authors don't pick out every single word for a specific purpose - maybe giggling instead of laughing for a baby because it's cuter, but not generally. More, to move the story along or fill in a gap. Most people don't expect their work to be delved into, people examining e-ver-y sin-gle sen-tence. Painstakingly combing through each and every word. I will never forget the time taken to go through Shakespeare for GCSE English. D.R.A.G. But back to the quote... 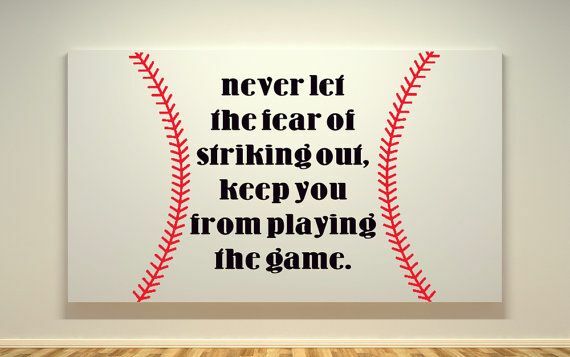 The quote relates back to the characters father and her childhood memories - both were avid baseball-ists (is that a word?). On the other hand, I have no history or knowledge of baseball so I may regard it as different inspiration. I have always taken this quote as something powerful and deserving of respect. Without lying, since the first time I watched it, back in 2004, it's struck me. It has stayed with me ever since. Don't let anything or anyone stop you from doing what you want to do; don't let fear of failure take over your life; don't let that mean bully put you down. The event may lead to failure, but choose to embrace failure as a learning tool of life rather than a negative. Everyone finds it hard to stick with goals and aims all the time and I am no exception, but I try to stick with it as much as possible.